Arizona Oncology offers non-invasive radiotherapy treatments, minimizing damage to normal tissue and the impact to your quality of life. Your doctor will perform an in-depth review of your case to enhance communication and guide individualized treatment recommendations. This will generally include input from surgical oncology, medical oncology, radiation oncology, reconstructive surgery, pathology, and genetics. Our team of experts use sophisticated computer planning systems to design treatment specifically tailored to your needs, while our leading-edge radiation delivery systems administer your treatments. The purpose of your radiation therapy is to damage or destroy cancerous cells by preventing them from growing or dividing, while minimizing adverse effects on nearby healthy organs and tissues. 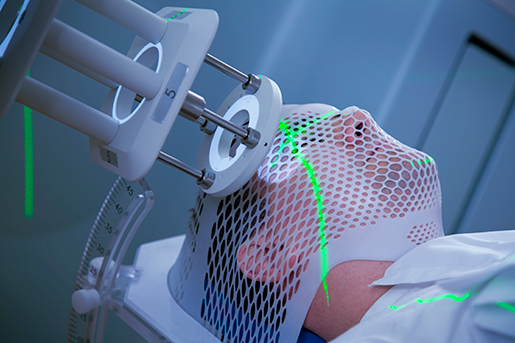 Radiation therapy is the use of high-energy radiation to kill cancer cells and shrink tumors. Radiation may come from a machine outside the body, or it may come from radioactive material placed in the body near cancer cells. High doses of radiation kill cells or keep them from growing and dividing. Because cancer cells grow and divide more rapidly than the normal cells around them, radiation can successfully treat many kinds of cancer. Normal cells are also affected by radiation, but most of them recover from the effects. To protect normal cells, doctors carefully limit the doses of radiation and spread treatment out over time. They also shield as much normal tissue as possible while they aim the radiation at the site of the cancer. Learn more about what happens before radiation treatments begin.